Nevertheless, we made it, his first visit and my second. 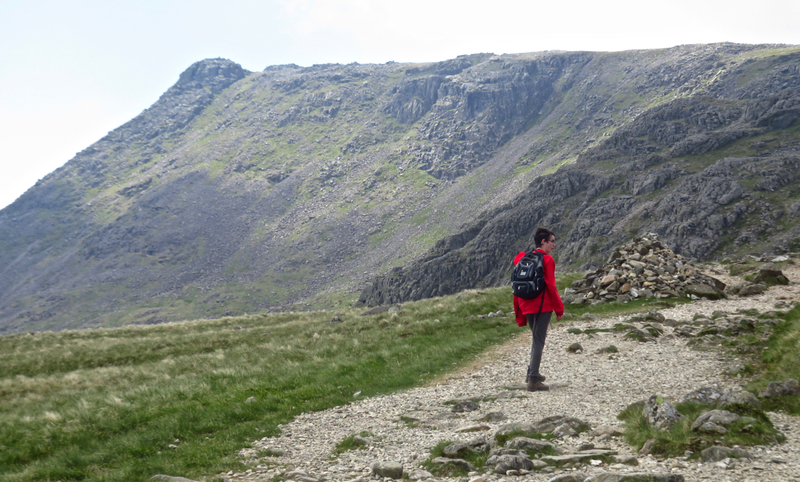 I will feel no need to rush back to Scafell Pike but so be it, I can live with that. 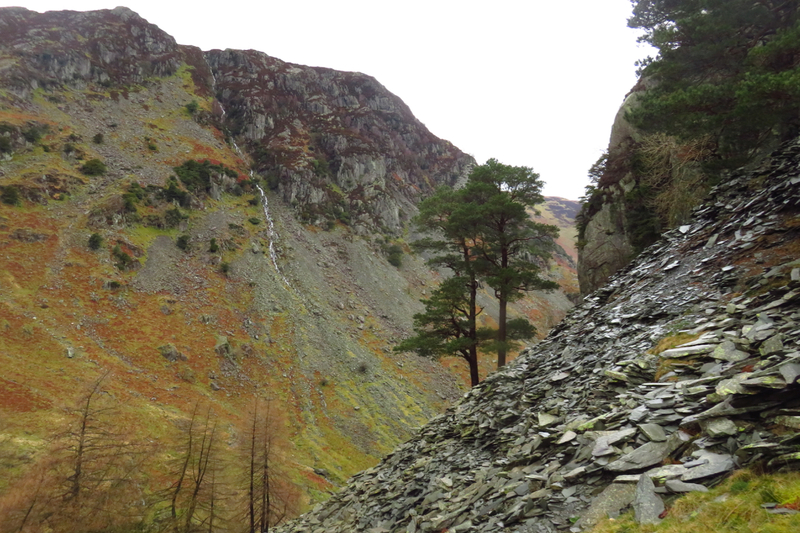 The walk also included neighbouring Lingmell — you can read all about it, as usual, on the relevant walk 146 page. One of the points of doing a second round was to reacquaint myself with those fells which, for whatever reason — usually bad weather — I didn’t feel I did justice to the first time round. Great Gable was definitely one of those, having been first bagged in really foul weather in July 2012 (walk 60b, which I still say was the worst single day’s walking I’ve done on this project). It was thus a great pleasure to return to it yesterday, May 2nd, on walk 128 which took place on a far nicer, springlike day. 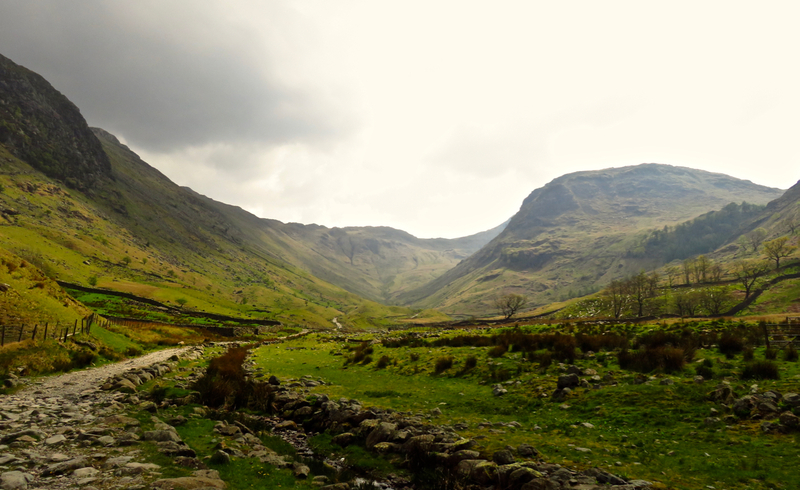 I came up from Seathwaite, perhaps not the most dramatic of possible routes up this noble fell, but it was still a fine walk with plenty of drama and excellent views. 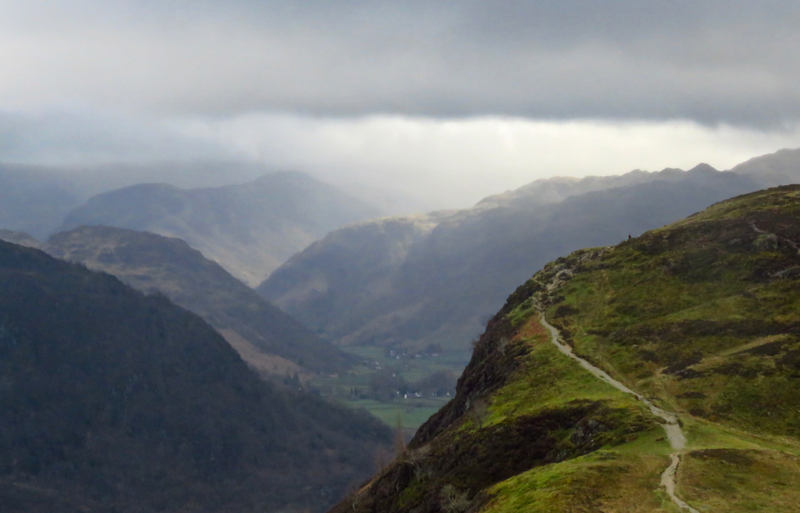 It also saw my first ever visit to Sty Head, a major walkers’ crossroads in Lakeland. Read more about it, with the usual crop of additional photos, on the walk 128 page. 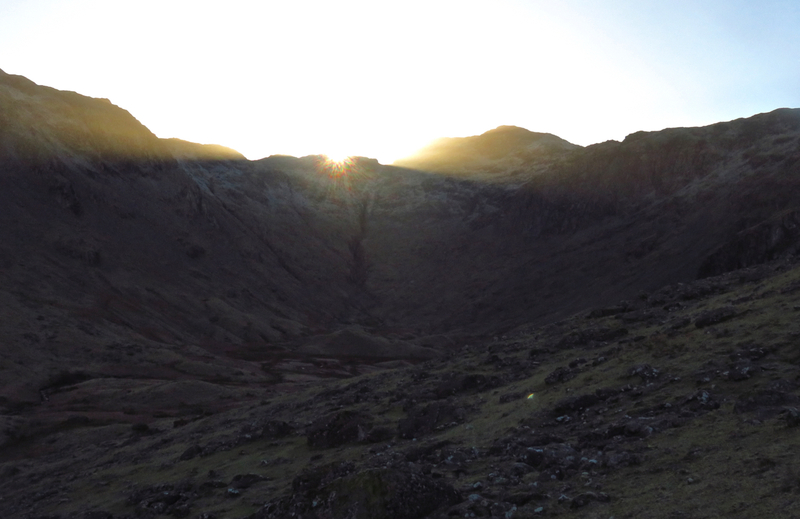 Great Gable was fell number 100 of my second round: so I have 220 to go. May’s shaping up to be a good month to get some more walking in, particularly if the good weather holds, so I hope to do my next walk before too long. Where will I do this? Who knows yet? That’s the good thing — I’ve still got more than two-thirds of the district to do again. Summit cairn, Allen Crags. Ill Crag (part of Scafell Pike) in the background. Walk 123 opened up for me thanks to 2nd January being a public holiday in the UK and also managing another very good weather forecast. 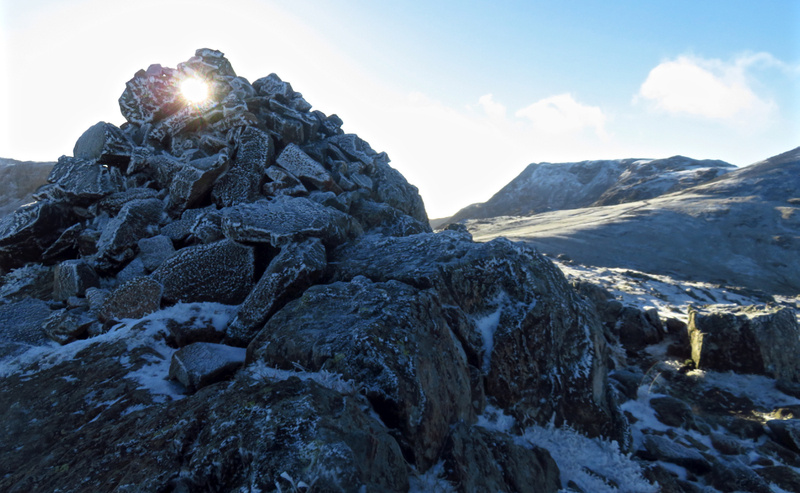 This forecast turned into actuality, with the day being bright and frosty, as you can see from this shot of Allen Crags‘ summit cairn. 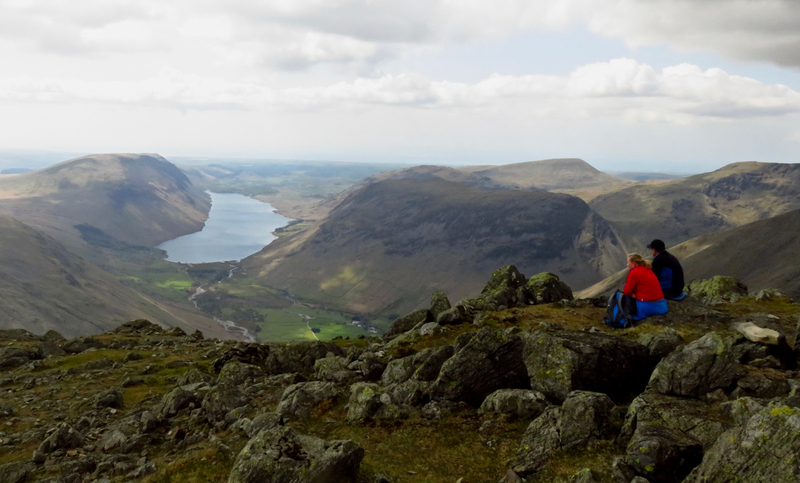 That, along with Glaramara and Rossett Pike, were the three fells bagged today. 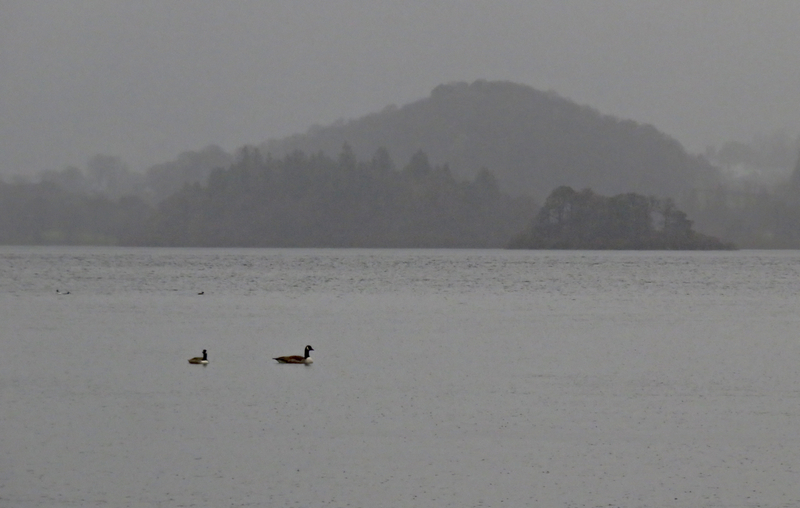 Read about my day, and see more photos, on the walk 123 page if you like. It’s back to work for me now, though — the new (working) year awaits. My next walk is hopefully going to be around 23rd – 24th January: depending on the weather as always, but I’ve been doing well with that for the last few months. As of today then, I have bagged 87 of the 330 Wainwrights in my second round, so have 243 to go. The rather good view from Brandreth. 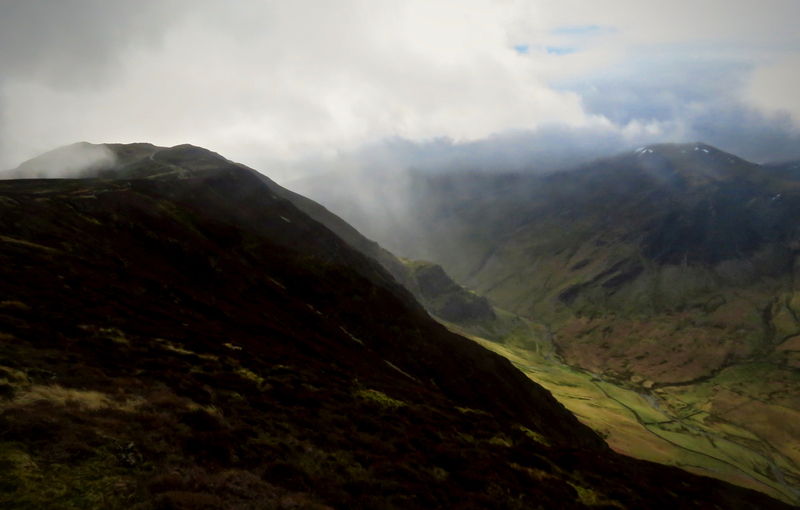 Ennerdale to the left, Buttermere valley to the right, High Stile range and Haystacks between. 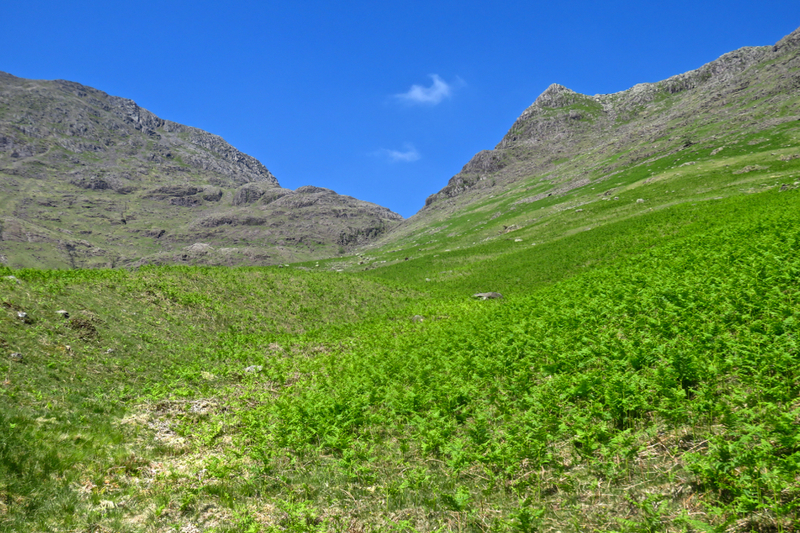 Well, I have had better days of weather on the fells — in defiance of a reasonable weather forecast — but in the end it was worth the effort to get out yesterday for a Bank Holiday walk around Seathwaite and Gillercomb. Walk 108 saw me bag four fells (three with colours in their name — for the trivia fans among us): Base Brown, Green Gable, Brandreth and Grey Knotts. These become numbers 29-32 of my second round of the 330, so I have 298 to go — the ‘300 to go’ point being reached on Green Gable. Highlights? The brilliant view from Brandreth as pictured (inadequately) here, surely one of the best in the District, England even. 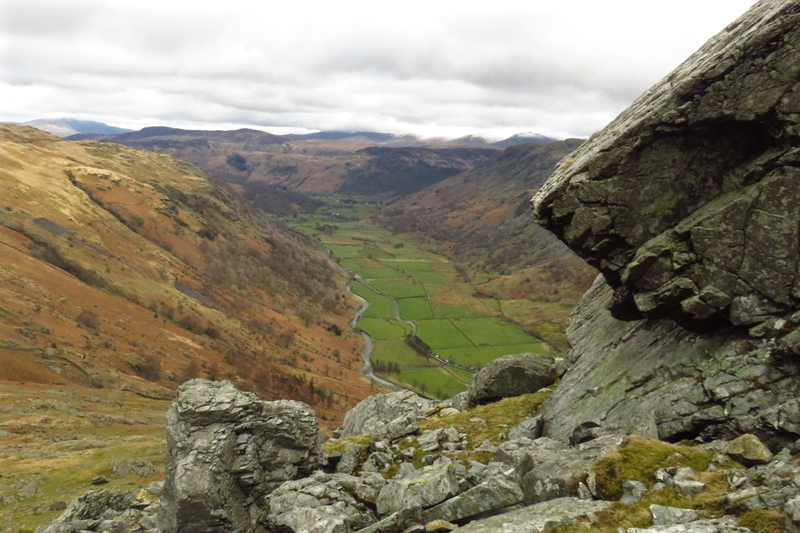 And I quite liked the climb of Base Brown, a little-known fell but it had a decent ascent via the ridge, passing some interesting natural features like this huge fallen boulder which must have ripped off the crag above in a cataclysmic break not long past.